The Afghan leader wrote the letter to Mr. Trump just a few days after the most serious negotiations between American diplomats and Taliban representatives ended on what both sides considered an upbeat note in Qatar, 1,200 miles away. 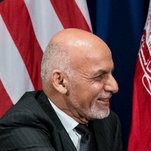 The chief American diplomat, Zalmay Khalilzad, told The New York Times there had been an agreement on a “framework” for two key issues — that the Taliban would prevent the use of Afghan territory by terror groups like Al Qaeda against the United States, and that the Americans would agree to withdrawing their forces. The official said the possibilities they had envisioned could save as much as $ 2 billion a year for the United States, drawing from areas such as maintenance contracts, and reduce the level of American troops to as low as 3,000. Mr. Ghani alluded to such savings during an appearance last week at the World Economic Forum in Davos, Switzerland, in which he argued for caution in any American withdrawal. Tags: Afghan, Cost, Exit, Leader, offers, Reduction, slow, Trump, U.S.